O'Shea has had success with Harlequins. 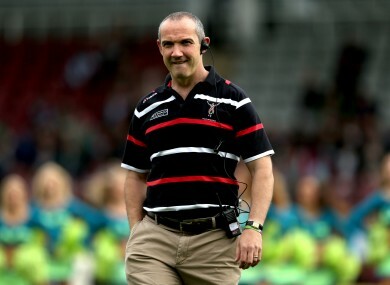 PROFESSIONAL RUGBY CAN be a stressful industry to work in but for Conor O’Shea, there is only a sense of great fortune. Passion drives the greatest performers in any field; without it the constant thirst to improve is absent. For O’Shea, his love of the sport has made him a success on the pitch and is now driving his still blossoming coaching career. The title of Director of Rugby at Harlequins offers suggestions that O’Shea is more of an organiser than a coach, but he points out that the majority of his work is done on the training ground of the club’s Centre for Rugby at Surrey Sports Park. The haul of silverware the 43-year-old is referring to is made up of the Amlin Challenge Cup in 2011, Aviva Premiership in 2012, Aviva ‘A’ League and LV= Cup in 2013. The latter two are competitions in which the club’s academy players are tested and improved, something which is hugely important to O’Shea. The Irishman’s CV includes three years as the RFU’s (Rugby Football Union) Director of the National Academy, where his brief included ensuring that talented players were being trained and developed to play rugby for England. That experience is reflected in his focus on bringing homegrown talent through at Harlequins. Daniel Hambury/PA Archive/Press Association Images. “Within our squad, we have 41 of 45 players who are English-qualfied. The majority of our squad have been brought up through our academy. They start in the Harlequins Academy right up from the age of 15 or 16. I never sit down and say that’s the ‘right’ way, but that’s our philosophy. “We don’t have the cheque book Clermont, Toulouse, these teams have, but what we want is a clear identity in the way we play. We want supporters to identify with what we are. So actually people who have grown up through our system and in the local schools. “Not all of them, you need the cultural balance. You need the likes of Nick Evans and Maurie Fa’asavalu because they give you cultural balance and a different way of playing. But by and large we want people coming through the academy. We do get funded for it yes, but we also believe that’s the only way. It is fascinating to hear O’Shea speak about developing players indoctrinated in “the way we play.” There is something of Barcelona and their famous La Masia philosophy in those words. ‘Quins are an ambitiously attacking side and have invariably been near the top of the try-scoring charts since O’Shea took over in 2010. The former Ireland fullback says his team’s style of play has been a mixture of his own outlook on rugby and the skills of the players who are available to him. “I think you have to set an identity and a style of play you want to see. At the same time, if you’ve got people like Danny Care, Nick Evans, Mike Brown at fullback, Joe Marler, Chris Robshaw, Nick Easter; they want to play with the ball in hand. Why train if you’re not going to play? David Davies/PA Archive/Press Association Images. “Philosophically, you’re not going to win on a consistent basis if you don’t go out and win it. I think you can eke your way to a certain number of wins, but really you want to control your own destiny and that’s what we try to do. “We try to go out and win things and I don’t know if that’s the ‘right’ way; everyone has their own way. This is the style that suits us. Actually, I think you can be talked out of playing that way, but we’re not going to be talked out of it. O’Shea the player would likely have thrived within the risk-taking, counter-attacking and high tempo game plan that his Harlequins side use. In 35 caps for Ireland, he was sometimes pilloried for being too loose in his play and it could be argued that his true ability was slightly under-appreciated. In his club career, O’Shea became a legend at London Irish after Clive Woodward convinced him to join in 1995. Under the future World Cup winning coach, the Exiles played a thrilling brand of rugby, with O’Shea and South African Brenden Venter to the fore. Again, those experiences have been a building block in his coaching attitude. “Yes, I think so. When I played, ‘bored’ would be the wrong word, but when the energy died in terms of my playing career was when a team didn’t play. I love playing with the ball in hands. When I was with London Irish, that’s what we did. “That’s what got me going. Having been brought up with my dad being a Gaelic footballer, I just loved having the ball. If I didn’t touch the ball I got bored. With Mike Brown, Ugo Monye, Tom Williams, I want the ball in their hands, I want them hungry for the ball. Take Harlequins out of the picture and this could easily be Joe Schmidt talking. Indeed, it would not be hard to pass the quotes above off as the Ireland coach’s thoughts on how he likes to see the game played. In terms of coaching influences and inspirations, O’Shea admits that the former Leinster man is right up there. “I really loved watching Leinster play, I’d pay to watch them. With Joe, just the way that he conducts himself, I think it’s great and Ireland are lucky to have him. He’s very open to a coffee and a chat. You’d give him a ring and he’d sit down and talk to you, so he’d have that chat. Email “Joe Schmidt is a big influence on my coaching style - Conor O'Shea”. Feedback on “Joe Schmidt is a big influence on my coaching style - Conor O'Shea”.